I walked through our parking lot recently. Heat waves were rippled from the concrete. Beads of sweat formed on my forehead and succumbed to the pull of gravity within seconds. I thought of how wonderful it would feel to have the steady ocean breeze to circulate the oppressively humid air. I was in such a hurry to get to the air-conditioning in my vehicle that I almost missed this little guy. I was two steps past it when my mind processed what I had seen. 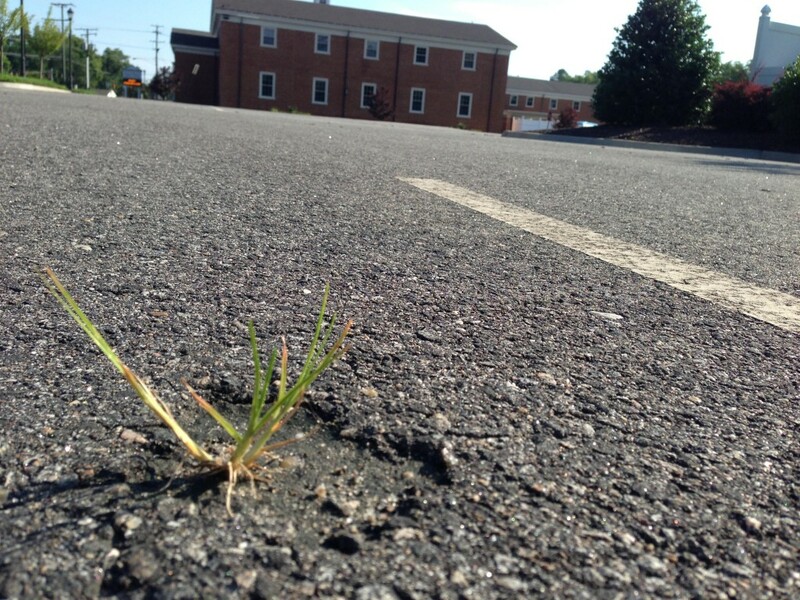 This little sprig of grass was growing in the middle of an enormous sea of hot asphalt in a tiny bit of sand that pooled during a rain storm. I was amazed. I took the picture to remind me of the phrase I heard from a ministry mentor, “Bloom where you’re planted.” (I Googled to see where he heard it. There are many sources it’s attributed to, and even a song written with the title but nothing definitive. So for now, he still gets the credit). I started thinking about my life and how often I might be missing opportunities to bear fruit of the Gospel, in my life, and for the Gospel, through my life because I’m always waiting or looking forward to or wanting a different set of – “right/better/perfect” – so I can give my all. When this Committee finishes this task/project I can focus on other, more important things. When the kids finish this season/play we’ll set better schedules, activities, and devotional times with them. As soon as we pay off this debt we’ll start saving or giving. Didn’t take you long to come up with something did it? You live where I live don’t you. This sprig of grass reminded me that I’ll never have perfect circumstances. When my kids finish one sport, another starts. Crazy how that happens, huh?!? As soon as that Committee finishes their project another will start or we’ll 3 others projects to implement the first one! We did however pay off the bill. Then we had a car wreck. Guess what? Now we have a new bill. See how it works…? Now I see the importance of a single word in Philippians 4:11, “I have learned in whatever situation I am to be content.” Notice that Paul says he “learned” to be content. It doesn’t happen naturally, but it can be learned if we persevere, walk with Christ, and trust him to help us grow, mature, and bear fruit for the Gospel.